Great Value in Lake Worth, Florida - Greaat Value Water Taste and Smells like Plastics and Chemicals. I would like to add. Since i wrote the last review earlier today. I went to a convenience store to get some other brand of bottled water to compare. The other water tasted and smelled just fine. I decided to smell the Great Value Water when i open it up and it has a very bad odor, almost smells like a cross between plastic and some type chemicals or smoke. This has happened to me several times over the past couple to 4 years. I don't do the shopping, and my wife seems to forget that it taste like plastic. When we first moved to south Florida we bought a coffee maker and took it back because we thought it was leaching that flavor into our coffee. It turned out to be this water. This needs something done about it. We are being victimized by big corporate america again. They are polluting all our water, than selling us this toxic garbage. Sorry about double posting complaints. But i could not add to the existing one. I've just had the same experience but with WinCo foods purified drinking water. I opened a bottle and it smelled like burned plastic and chemicals. I taught nothing of it and took a sip. it tasted horrible and left a awful tingle in my mouth. I curiously opened another bottle to find the exact same smell and taste. I opened another 5 bottles to find 2 of the bottles have contained this awful taste and smell. The other 3 seemed fine and tasted like normal water. I'm not sure if this is just a "bad batch" or if their is greater problems. In addition the "Best If Used By" date is 16 Dec 2018. I'm writing this a good year and a half before that "expiration" date. Btw I know that this is for Great Value but upon reading the post I had a very similar experience and decided to share. Same problem here. The water tastes horrible and smells like sulphur. I like the convenience of the Walmart Neighborhood store, but have to shop for water elsewhere. I've been drinking Great Value water for a couple years and have never had any bad taste or smell. I'm very satisfied. I bought Great Value brand bottled water for the first time recently. The first bottle had an off taste but I didn't think too much about it. So, when the next bottle smelled and tasted funny I decided that I wasn't going to drink anymore of the water. About 5 days ago I started having severe diarrhea and nausea. The nausea is gone but I'm still having diarrhea. Before I came to this conclusion another thought was that my symptoms were from an antibiotic called Vantin (Google it). I took this antibiotic 8/14/14 and 11/11/14 and it can cause severe diarrhea several months to a year after stopping. I also took it 4/13/13 and didn't have any issues. I am inclined to think it was the water. Review #679687 is a subjective opinion of PissedConsumer679687. Great Value in Lake Worth, Florida - Leaching Plastics into Bottled Water ! I have tried the Great Value Water several times over the past few years. Every time i even put any of the Great Vakue water in my mouth it takes like plastic. It is discusting to say the least. And i'm sure it can not be healty to be drinking leached plastics in my food. And yes it does make me feel sick to my stomach. I made coffee with it and the flavior had changed so much thats i was not able to even handle drinking coffee. So i put it in my pump sprayer to final rince my truck next time i was it. So it dont spot when it drys,. This stuff shoppudl be investigated. As i said it can not be safe for human consumption as it is sold for. I would not give my Dog this ***. It is terrible. They care so little about other peoples health , that they dont mind risking all our health to make some money off what should be free Water. Review #679612 is a subjective opinion of poster. Bought the great value bottled water from store in Sherman tx while moving. Drank a ton of the water the day of and after the move. It seemed to have a funny taste but we were so thirsty we didn't think much of it. Now my entire family has upset stomachs and can't stay out of the bathroom. Not sure if the water was contaminated with something or what but we all feel awful. Review #648258 is a subjective opinion of PissedConsumer648258. I bought a. Bike and. First time I use the bicycle it broke took it back where I bought it store 3388 in. Lawrenceville ga and assistant manager was a racist and treated very bad and didn't wanna help me and it didn't change my bicycle or exchange told us he couldn't help us and to leave I ask to speak to another manager and he didn't want to help. Review #636207 is a subjective opinion of PissedConsumer636207. For economic purposes I switched from my reliable Glad drawstring kitchen bags and bought the cheaper walmart brand. Every bag I put in even if the entire load weighed 5 pds busted at the strings. I had to double bag each load with a stronger Hefty or Glad bag. Walmarts website had wonderful flowery comments about these bags. Were they all using the same bag I purchased? Something sounds a little suspicious about those reviews so I decided to post it here so others will not fall prey to the same dilemma. I will stick with my tried and true Glad and Hefty bags from now on! Review #629287 is a subjective opinion of poster. 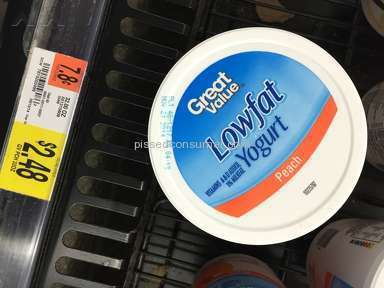 Finding expired Great Value Yogurt. Brought to the attention of manager on 11/23/14,. pictures taken and shown to employees. Checked on next weekend and noticed they haven't solved the problem and still have expired items for sale. Again was brought to the attention of cashier and Manager Assistant since manager wasn't present at the store on 11/30/14. I was at the store again on 12/03/14 and noticed once again the walmart still have those items for sale in plain site. Please feel free to contact them about the problem. 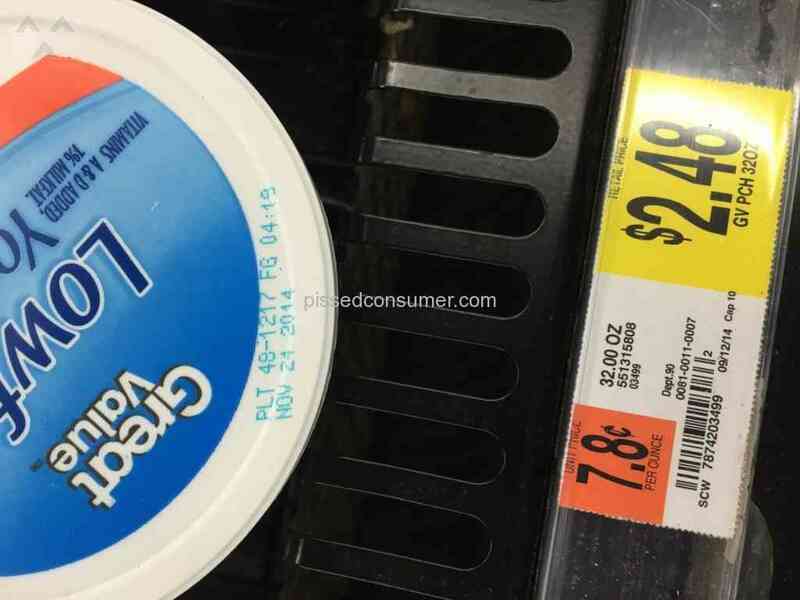 I went to Walmart in olathe Kansas on the 3rd of October and in the milk racks had milk that was all rotten and curdled and i check the expire date and it stated "Best Before September 04, 2014"
why don't you also bring this to walmarts attention via their customer service ? i'm sure they'd love to know about it. I work retail and I can tell you if/when these things happen it can slip by, but it seems like this particular store isn't actually fixing it. I know when my store receives a call from customer care it's taken very seriously, even if the answer is obvious to everyone it's taken seriously. I would definitely contact Wal-Mart and find out their customer care/support or whatever they call it's #. if they do nothing i'd contact your local tv station. many have investigative teams that love stories like this to find out why it isn't being fixed when it's brought to their attention and their continuing sale of expired products. Review #565570 is a subjective opinion of poster. I shoulda known better...I was in a hurry. Product no. 078742040141, Great Value 1250 Sheets in Every Roll Bathroom Tissue 12 Rolls. The last time I saw see-through bathroom tissue was in London in the 70's. At places like the Tower of London, TP dispensers dispensed 2 sheets of unbleached paper that were transparent, slick, unabsorbent, and melt in your hand. Slick paper doesn't wipe, it just spreads ---- around. Yours is bleached and each sheet of yours doesn't proudly proclaim, "Property of Her Majesty's Government," but, other than that, your product is identical. I have ~1000 sheets still on the first roll, + 11 unused rolls. (Some got used before I was able to replace it, since, unlike London, I could use as much as I wanted, crumpling it to make it more effective.) I can't figure out for what else I could use it. It resembles the tissue paper used in gifts, but I don't think my friends and family would appreciate it if I used it for that purpose. I can stuff out-of-season shoes when I store them to keep their shape. Back in the 70s, I even wrote a friend describing the bathroom tissue in various countries public restrooms. I'd decided a nation's TP reflected upon the character of those countries citizenry. The details of these reflections had to deleted after I read the PC Terms of Service. Review #547171 is a subjective opinion of PissedConsumer547171. Review #545895 is a subjective opinion of poster. I bought a 2 Litre bottle of Club Soda. When I opened it for the first time, I thought it was odd that there was no "psst" sound. When I tasted it, the soda was completely flat. I checked the expiry date (expires in the next year) and the cap's seal was intact before I opened it. If I wanted water, I would've just turned on my tap instead of making the trip to Walmart to buy the soda only to have it be flat. I then turned the bottle to see the "satisfaction guaranteed" label and went to the website listed. Unfortunately, it was a generic Walmart website with no direction on how to provide feedback for a faulty Great Value product. take it back and get a refund then they are usually good about that, and you must be a retard if you think that flat soda tastes like water. Review #535603 is a subjective opinion of PissedConsumer535603. I just bought 3 28oz cans of great value baked beans warmed them up and served them to my family. About 5 minutes into dinner my 11yr old started choking when I did the Heimlich Maneuver out poped a bolt that was in her beans! I called the local walmart where I bought them and got placed in hold when I called back 3 different times I did not get an answer! Walmart in Las Cruces, Nm on Valley, manager is Anthony Martinez! Also the day before I went to buy a fer things that uncluded butter and was charged for two tubs of butter rather than one. IF I DONT GET AN IMMEDIATE RESPONSE FROM SOMEONE THIS WILL BE IN THE NEWS QUICK!! Why didn't you contact the people who made the beans. Walmart did not make or pack them. Also you need to be able to prove both of these accusations. I doubt if your silly threats will help any either. It seems like the person posting this review planted the bolt in her child's food in order to get a settlement, this person needs her child removed from the home to a home where the parent will care more about the child than money. This could have been worse. The only thing is that I'm a Nurse and my training and quick reflexes are why this situation is not worse then it could have been. Review #528590 is a subjective opinion of PissedConsumer528590.